PMML (Predictive Modelling Markup Language) is an XML-based standard that expresses analytics models. It provides a way for applications to define statistical and data mining models so that they can be easily reused and shared. The standard is particularly helpful because the analytics tools used to generate models (tools such as PMML:R, KNIME, SAS, and SPSS) are very different in architecture from the tools used in an InterSystems IRIS or production environment. For more information, see http://www.dmg.org/. You can define a PMML model class, which is a subclass of %DeepSee.PMML.Definition that contains a PMML model. When that class is compiled, the system generates the code needed to execute the model or models described in it. InterSystems IRIS provides an API for executing the models, based on the data input that you provide. InterSystems IRIS provides a sample test page that uses the API. 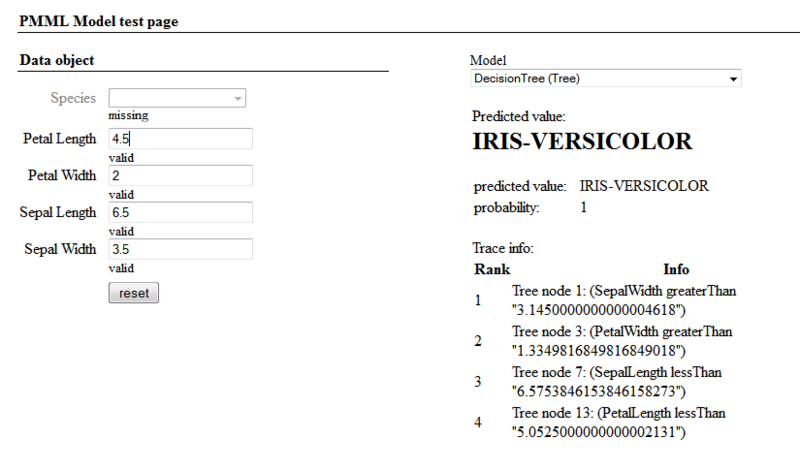 InterSystems IRIS also supports the <MiningModel> element, which provides “Model Segmentation”  the process of combining the output of multiple models for a more balanced prediction. See http://www.dmg.org/v4-1/MultipleModels.html. Note that InterSystems IRIS does not support the “Model Composition” approach, which is deprecated. This article uses the Samples-Data-Mining sample (https://github.com/intersystems/Samples-Data-Mining). InterSystems recommends that you create a dedicated namespace called SAMPLES (for example) and load samples into that namespace. For the general process, see Downloading Samples for Use with InterSystems IRIS. This sample includes a copy of the Iris data set, a well-known sample used in predictive analytics. The Iris data set provides measurements for the petal and sepal measurements for approximately 50 flowers in three different species of irises. These measurements are strongly predictive of the iris species. Access the PMML model testing page (described later in this article). For Class name, type a fully qualified class name. For PMML file, click Browse and select a PMML file..
For information on setting up and using this sample, see “The Iris Sample,” earlier in this article. <X-SQLDataSource> defines a data source in terms of an SQL query. This element defines a mapping from the SQL fields to the data fields in the PMML definition. <X-DeepSeeDataSource> defines a mapping from the measures and dimensions of a given cube to the data fields in the PMML definition. PackageName.ClassName.Data represents the data needed to execute the models. This class corresponds to the <DataDictionary> element of the PMML definition. This class provides methods to execute the model. PackageName.ClassName.ModelName.Input represents the input for the given model. PackageName.ClassName.ModelName.Output represents the output for the given model. InterSystems IRIS uses these classes to execute the model or models. Switch to the appropriate namespace. 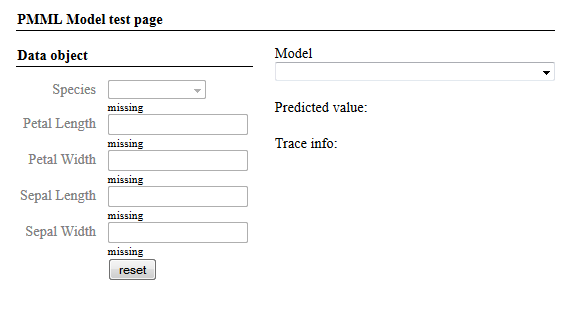 Click Analytics > Tools > PMML Model Tester. Click Open, select a model class, and then click OK.
Click a model from the Model drop-down list. Analysis dataset  Selects the source data on which the model was developed. Cube mapping  Selects the <X-DeepSeeDataSource> element in the model, if any. See “Supported Data Dictionary Extensions,” earlier in this article. Custom data source (SQL)  Enables you to enter an SQL query that provides a set of records. If you selected Custom data source (SQL), type an SQL SELECT query into Custom data source. The fields listed in Data object correspond to the data fields in your PMML definition. InterSystems IRIS also provides an API that you can use to execute PMML models. Create an instance of the generated class PackageName.ClassName.ModelName. This class defines methods you can use to execute the model. Create an instance of the generated class PackageName.ClassName.Data and set its properties. The purpose of this instance is to contain the input values. Invoke the %ExecuteModel() method of the model instance. For pData, use the data object that you created in step 2. This method returns, as an output argument, an instance of %DeepSee.PMML.ModelOutput that contains the output of the model. Specifically, this is an instance of the generated class PackageName.ClassName.ModelName.Output for the given model. To see the details for the output, use ZWRITE. The pOutput object includes one property for each <OutputField> in the <Output> element of the model definition. If there is no <Output> element, pOutput includes a single field named after the predicted <MiningField> element. Or , if you specified <X-DeepSeeDataSource> in your PMML definition, use %ExecuteModelDeepSee(). See the class reference. 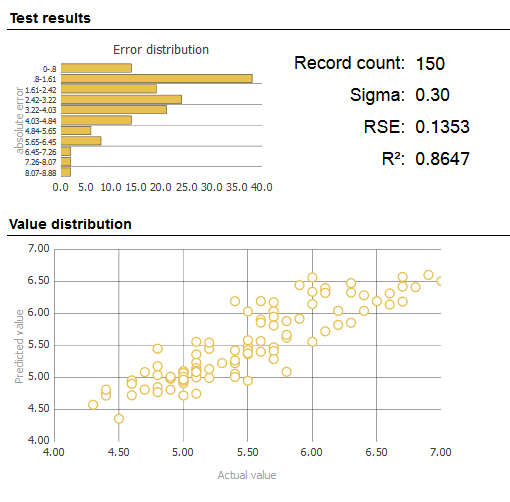 To run a predictive model with a batch of input records, use the %RunModel(), %RunModelFromResultSet, or %RunModelFromSQL methods in %DeepSee.PMML.Utils. These methods store the resulting predictions in the %DeepSee_PMML_Utils.TempResult table. For background information, see Defining Models for InterSystems Business Intelligence. fieldName is the quoted name of an output field of an InterSystems IRIS PMML model class. series is the optional number of a series (row) in the plug-in. Specify 1 or omit this argument. modelClassName is the quoted name of an InterSystems IRIS PMML model class. "%cube"  Specifies the cube on which this KPI is executed. "ModelName"  Specifies the name of the model to execute. If specified, this must be a model in the given model class. If left blank, the first model in the class will be executed. "aggregate"  Specifies how to aggregate the predicted values over different facts. The available values are "average" (the default), "sum", "max", "min", "maxFreqValue", "maxProbValue", "minFreqValue" and "minProbValue". Note that not all aggregations might make sense for each output field. "NullValues"  Specifies whether or not to include null predictions when aggregating results. Available values are "ignore" (the default) and "count". The order in which you list the parameters does not affect the results. The special %CONTEXT parameter to cause the plug-in to consider the context of query, which is otherwise ignored. For details, see the reference for the %KPI function in the InterSystems MDX Reference. To include record-level predictions in a detail listing, you can use the $$$PMML token in the listing query. This token takes the PMML definition class name and the model name as its primary parameters. As an optional third argument, you can pass the name of the predicted feature you wish to include in the query (this argument defaults to "predictedValue"). UserID, TotalWagered, PercentLost "Lost %" , $$$PMML[MyPMML.Poker,PercentLost] "Predicted Loss %"
After you run a predictive model with a batch of input records, you can export the results to a cube. This option enables you to visualize the results in a different way. The cube contains two levels: ActualValue and PredictedValue. Result class name  Specify the name of the persistent class to which the results are written. This is used as the source class for the cube. Link to source class  Specify the class that contains the source records. The result class includes a property named Record that points to this class. Drop data  Select this if you want to empty the result class (Result class name) before performing the export. Or clear this if you want to append the newly exported data to the end of the result class table. Cube name  Specify the logical name of the cube. Cube class name  Specify the class name of the cube. Overwrite classes  Select this if you have performed this export earlier and now want to overwrite the classes with new data and definitions. The system then displays the Build Cube dialog box, where you can build the given cube. Click either Build or Cancel. You can also later access this cube via the Architect and build it there. Also, you can also generate a PMML model class from a Spark pipeline model (org.apache.spark.ml.PipelinModel). To do this, call the iscSave() extension method provided by the InterSystems Spark Connector. Note that Spark ships with an older version of two PMML JAR files than JPMML needs, so you must remove these JAR files from the $SPARK_HOME/jars/ directory to avoid conflicts. For details, see https://github.com/jpmml/jpmml-sparkml#library. Note that only the last three lines are specific to generating a PMML model class. Now you will see a PMML model class named abc.TestMe class in the IRIS master namespace. You can use this model as described earlier in this topic. For more information on the InterSystems Spark Connector, see Using the InterSystems Spark Connector.